Recently converted extensive stone barn with spectacular views situated on a working farm. Sleeps 6 (1 double and 2 twins). Vaulted ceilings and wood burning stove with gallery sitting room. Private garden and off road parking. The Tractor House at Pengwern Farm, Llethryd is a tastefully renovated stone barn situated on a working farm on the Gower Peninsula approximately 8 miles from Swansea. The Tractor House is a wifi free zone, so come and chat to your family whilst on holiday! 3 bedrooms – 1 with double bed and an en-suite bathroom, 1 double bedded room and 1 twin bedded room. There is another bathroom with shower, shaver point, WC and wash hand basin (as the en-suite). The Tractor House has ceramic floors throughout with underfloor heating. This heating and the hot water are provided by an ecologically friendly heat pump system. Fully equipped kitchen with ceramic hobs/electric oven, microwave, fridge freezer, dishwasher and washing machine, with a door out onto the deck area. The first of the living areas (dining room) is vaulted and beamed: with an Aga multifuel stove, armchairs and dining table with 8 chairs. From here through the patio doors is the decked area overlooking the valley and the panoramic views which you can also enjoy from the kitchen and from the upstairs lounge. Upstairs in the lounge there are futon sofas and beanbags, a wall mounted digital TV with Freeview and DVD player. From the upstairs window enjoy the views over the valley. There are two barn conversions next to each other and are therefore suitable for parties who wish to holiday together. The Tractor House sleeps 6 people and the adjacent Barn also sleeps 6. The Tractor House is fully furnished and well equipped. You will need to bring bed linen and towels. Hand and tea towels are provided. A travel cot and high chair are available on request. Cot linen is not provided. 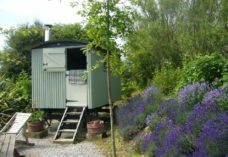 The Tractor House at Pengwern Farm, Llethryd is available primarily for weekly bookings although weekends or midweek breaks are available at certain times of the year. Please telephone or email for availability. Please note that there is no smoking in The Tractor House or anywhere near the farm buildings. Pengwern Farm is sure to satisfy everyone, from those who prefer the peace and tranquillity of the countryside, to those who are looking for a more energetic and active holiday. The Gower Peninsula, Britain’s first designated Area of Outstanding Natural Beauty offers visitors a range of activities throughout the year.